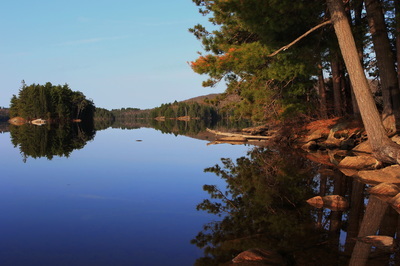 The first day Algonquin would issue canoe camping permits in 2015 was May 1st. This camping trip began that day. ​It looked like the ice was going to clear off right in time for some gorgeous weather, so I was paying even closer attention than usual to the ice-out conditions. As always, I was watching the satellite imagery to see the steady march North of lakes turning from white to blue, but I was also following APP's tweets, as they had a flyover planned to assess the ice conditions. Camping season was starting soon no matter what, but the big question was if it would open on, or after, the coming weekend. The flyover confirmed what everyone was hoping: the ice deterioration was substantial, and camping was upon us! 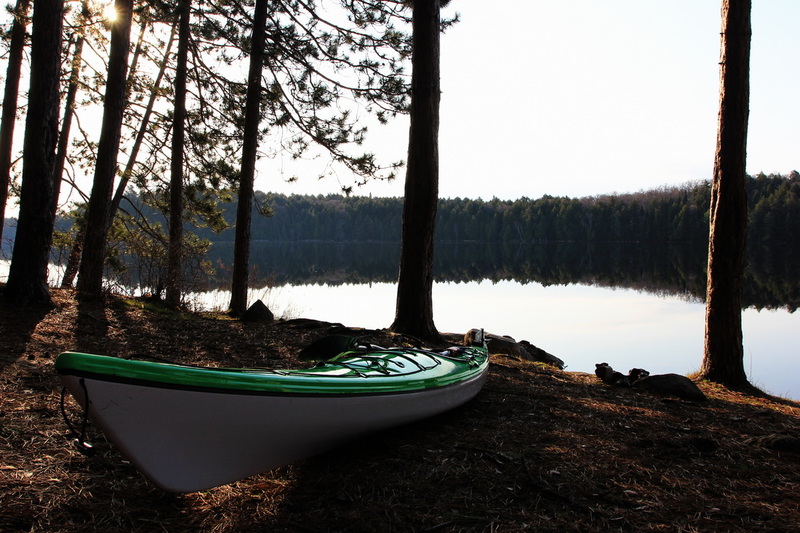 APP announced that canoe camping permits would be issued starting Friday, May 1st. They excluded a few specific lakes, which still had enough ice cover to cause issues. I'd been camping on a number of occasions not long after ice-out, but I'd never been on opening day before. I decided this was the year to fix that. While my camping trips usually involve a pretty lengthy first day to get beyond the more crowded interior lakes, I knew it wouldn't be necessary on this trip. 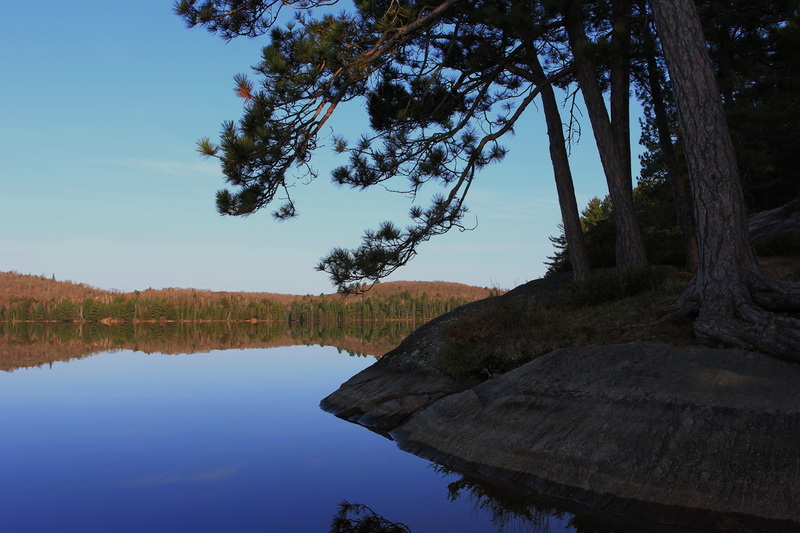 I decided to take the opportunity to spend a night on a lake I'd never camped on before: Joe. 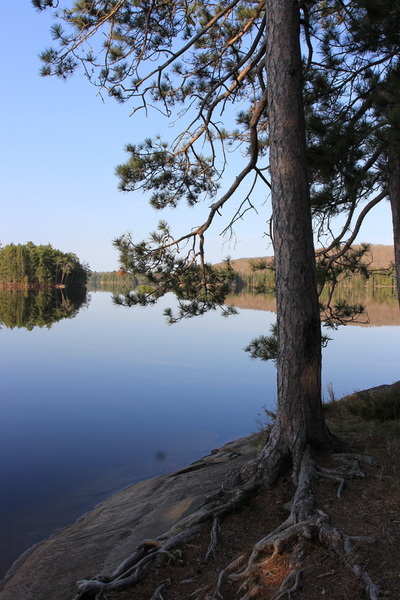 While Joe is a beautiful lake, it's also easily reached from the Canoe Lake access point, and as a result is a very popular camping destination. My experience with Joe until this trip had entirely consisted of paddling through it en-route to more remote destinations. I had to work that morning, so I reached the Canoe Lake access point around 3 PM. I counted seven vehicles in what is usually an overflowing parking lot - seclusion and solitude were all but guaranteed. Having no need to work hard for peace and quiet, I booked what is perhaps the easiest trip I'd ever done. Night 1: Joe. Night 2: Burnt Island. It was just a quick trip into some nearby lakes to kick the season off. Permit in hand, kayak unloaded from the car and dry bags tossed on the ground around it, I drove the car up the short distance to the parking lot. After scouring the car thoroughly to make sure I wasn't forgetting something (part of the ritual on every camping trip), I locked up and walked back down to the shoreline. The water temperatures were dangerously cold, so in addition to my usual gear I was wearing a 'shorty' wetsuit. In the event of the worst it wouldn't ensure my survival, but it would buy me some time. It's part of my gear on all early and late-season trips. As it was already mid-afternoon I didn't stop to take photos or videos. I paddled Canoe Lake, a trip I'd done so many times I never glanced at the map. The 260m portage around the dam was, as always, one of the easiest in the park. Then it was simply a matter of paddling under the bridge, and deciding which part of Joe I wanted to set up camp on for the evening. While I'd been through Joe dozens of times I'd rarely paid more than cursory attention to the campsites (other than to notice that they were generally always occupied). I prefer westward facing sites, which narrowed the options considerably. The plan solidified to heading in the direction of Burnt Island and stopping when I saw a site that looked worth stopping for. Joe was empty. I saw no campsites in use or canoes on the water. 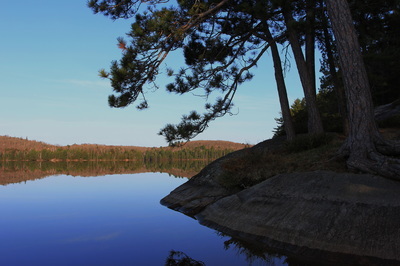 I finally stopped at a site towards the East end with a beautiful westward view, and a big chunk of Canadian Shield rock overlooking the water. Camp set up, firewood gathered and a fire burning, I sat overlooking the water and filmed a short video while waiting to cook dinner. It had been a long day. 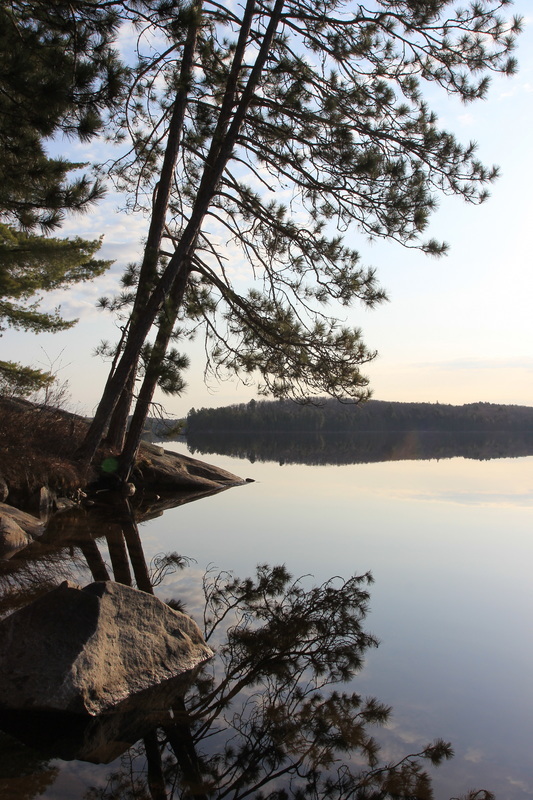 Dinner eaten, camp cleaned up, I crawled into my tent for the first night in Algonquin in 2015. Joe to Burnt Island is not only an easy bit of travel, it's one I'd done on many occasions previously. As a result the camera stayed packed away, and I simply got on with it. I was gunning for a site on Burnt Island I'd camped on before and absolutely loved. A point site with exposed rock and beautiful views, it's the kind of site you'd always check out but always find occupied. Except, of course, on the second day of kayak camping season. Soon enough I'd moved my camera down to the waterline to film the pain I was about to be in. Ice had been on these lakes only a few short days ago - it was not going to be pretty. The water was incredibly cold. It reinforced to me the danger of beautiful spring days when the water temperatures are still frigid. I had been sticking near shore while on the water, but 'near' varied pretty wildly as I cut across bays, or prioritized the shortest route over the safest. I realized that being relatively near shore might not be good enough if I were to dump into the water, and vowed to take the conditions a bit more seriously. ​But it was a beautiful day and I was on a gorgeous site, and the afternoon passed as only days in Algonquin can, with no thoughts of anything but the present. Being back in the park after a very long and cold winter felt like heaven. As the afternoon passed into evening, I saw the first other campers of the trip: two people in a canoe, wearing no life jackets. With my hours-old experience of what the water felt like when submersed in it, I could only shake my head and wish them well. I did take a few photos, but none of them turned out to be worth sharing. Evening passed into night and I crawled into my tent, exhausted from a day of soaking up vitamin D.
I woke up to clear skies and calm weather, and the camera came out in a hurry. And while those were the first decent pictures of this trip, they were also the last. The purpose in this trip was to get out and say Hello to Algonquin as soon as the ice cleared, to reconnect with a place whose beauty draws me back year after year. This trip gave me the opportunity to camp on lakes I would normally not stay on, and to do so at a time when I had them to myself. The weather was beautiful, the campsites were amazing, and the swimming was something I'll never forget. I lazed about for a bit that morning, but then started packing up for the trip back to the car. I was in no hurry: not in the packing up, or the paddle out, but all too soon the Canoe Lake Outfitters came into view. I vowed to return as soon as possible, but this trip, a quick 'there and back again' was at an end.